Turbat’s Creek in Cape Porpoise is a piece of southern Maine coastline that has the same look as 40 years ago. The cluster of traditional fish shacks is still there. The water in the creek is cleaner now than it was then. It’s a favorite spot for painters. When you visit you will know why. At low tide the creek is so shallow you can wade through it and walk out to the nearby island. All kinds of old dock pilings poke out of the sand on the edge of the creek near the fish shacks. It was sunny and warm on this day. I chose this location for a meeting of Plein Air Painters of Maine. When I arrived Ellen And Flo were already busy painting. Flo had a big solar umbrella that kept both her and the easel out of the direct sun, so she could see her colors clearly. Barbara arrived and tucked herself in under the shade of some small trees for a good view of the back of the fish houses. Carol went out on the pebbly beach near the harbor. Painters were all over the place! It was a hub of productive activity on the creek today. 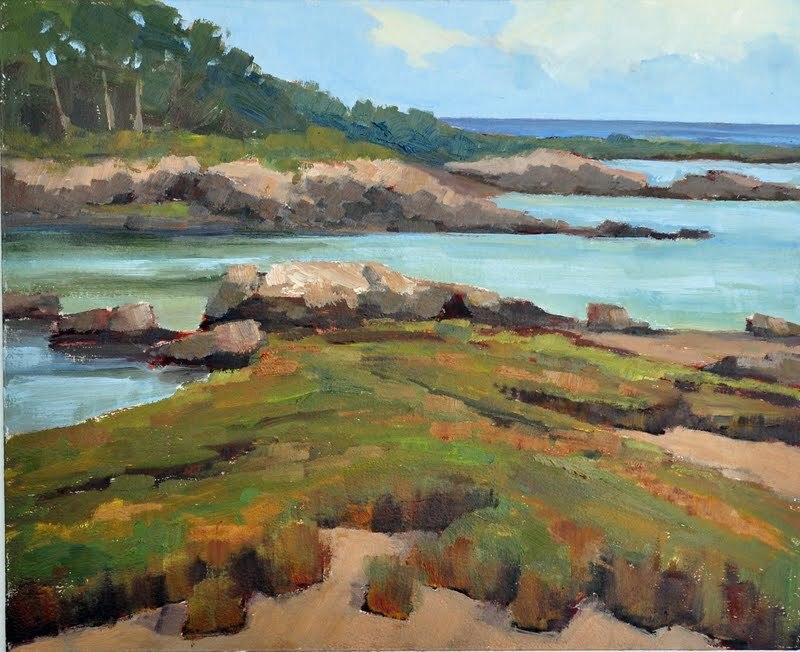 I spied a nice patch of marsh grass with tidal pools looking toward Vaughn’s Island. I sketched my design in pencil. Next I painted in the view on my panel in burnt sienna. I marked my dark areas and looked at the shapes I was placing. I put in colors and kept building the shapes in a three dimensional form as I went. The day started out perfectly clear. In the early afternoon clouds began to fill the sky. It was actually nice to have some relief from the sun. The cast shadows made the landscape look more interesting. When I had arrived at Turbat’s Creek in the morning the tide was low and still going out. Recently I’ve been painting larger on location. Today I was painting a mid-size painting and finished most of it on site. 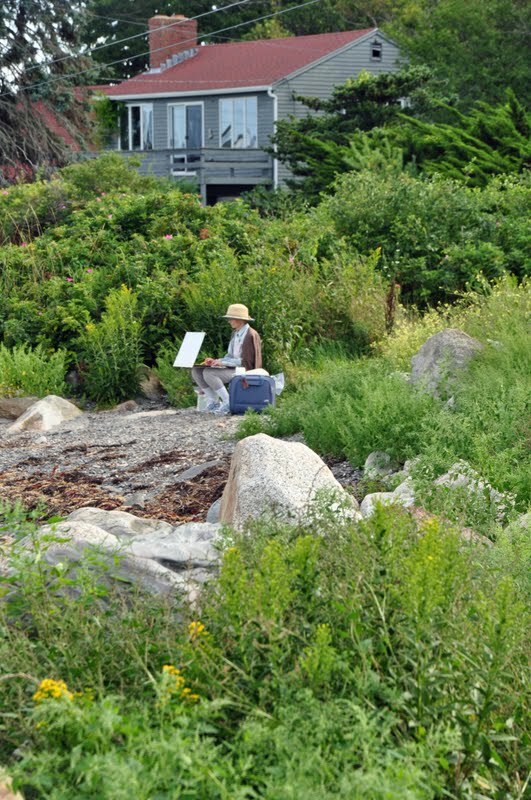 My husband Marcus arrived by mid-afternoon and set his easel up by the boat launch near a fish shack. Painters arrived and departed all day long, some came early, others came late in the day depending on their preference for lighting conditions. Suzanne arrived to paint the late afternoon light from a nice vantage point on the the rocky beach. There were many visitors coming by all day. It was great! I saw friends I hadn’t seen since last summer. I’d stop to talk to them then continue on with my painting. The sun dropped lower in the west, and the colors on the land, sky and water were beautiful. This is my favorite time of the day to paint. Long shadows stretched across the sand. I had recorded enough information to call it a day. I can finish the painting in the studio. I went to over to the beach to tell Suzanne I was heading home. She and I were the last painters left. Suddenly a police car and big red truck towing a boat pulled into Turbat’s Creek Road. 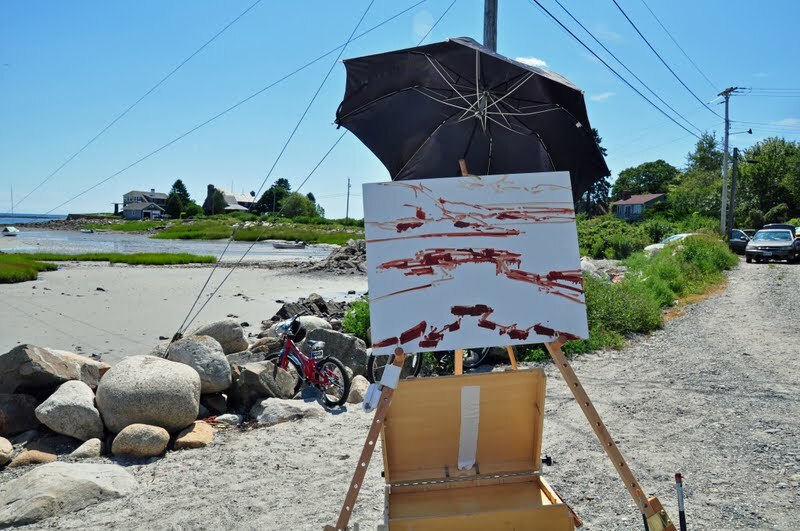 I had to move my easel out of the boat launch area – fast! The police launched the boat in the water and took off for Vaughn’s Island – hot on the trial of some outlaw reported to be over there. It was an exciting day at Turbat’s Creek. I was happy to head home with an almost finished painting! Frenchman Bay on the north side of Mount Desert is scattered with islands named the Porcupines. They have pine and hardwood forests on them with rocky cliffs and sandy beaches trimming their edges. I sketched view this from the overlook on Cadillac Mountain. The tide was half way out and you could see the sandy skirts around each island. The next day I was headed up the mountain in the late morning. The bay was still calm but the wind was starting to pick up out on the water. From the mountain you could watch the wind patterns across the bay as it went from still water that was iridescent yellow green to wind whipped dark blue. This is Great Head with a huge cloud bank lifting off it. On the loop road heading toward Thunder Hole you enter an alley of pines. Great Head and all the ledges facing the open ocean were bathed in foam this day. The water had long ribbons of creamy froth all up and down the coast.